I rarely have these awkward silences as I talk a lot and am brimming with stuff to share. Good for you, dear Pineapple. Sometimes it gets a tad boring for me to get introduced to people. If I am interested, I can rattle on about education, weather and life in general. 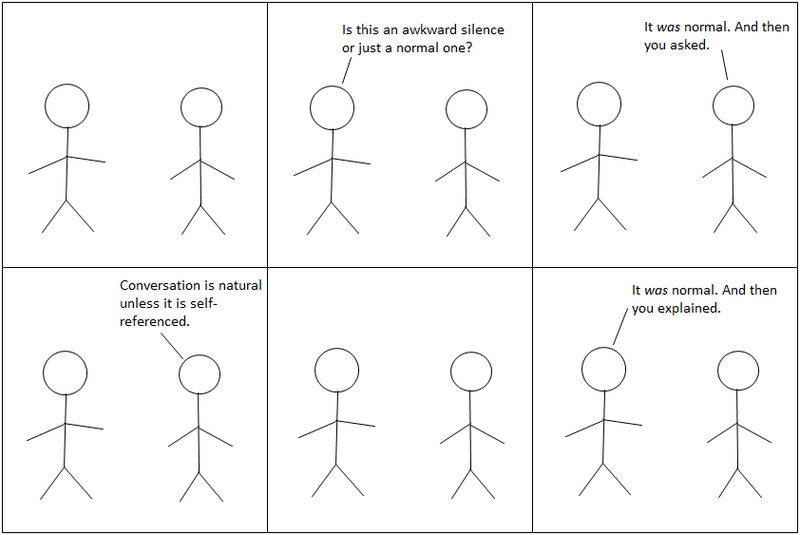 I know , these silences can get really awkward. Oh yes, eerie silences are also present. I am also thinking of movie houses where scary films are played . . . when there is a crucial point . . . there is a silence which is eerie and then a scream . . . Reality jolts us!! I experience them...but, again they are not very often. You must be having a tough time with the adolescents. Even in teaching, we face problems with the kids. And, comfortable silence is always welcome. who 'know' each other so well. It is a higher pleasure to just "be with" the other. Realize that is not your topic, Susan Deborah. you staying? You must really enjoy your work? What do you do for leisure? What is your favorite place in the world to live? To visit? (I know I'm not the timely-est of responders. Yes, time is a factor, but truth is, don't we all find the time to do what we wish? but right here is preferred, by ME! LOVE, Susan, and PEACE, you comment-starved girl--grin!!!!! Sometimes silences are the best conversations but during moments of awkward silences, even conversations don't help! Good strategy. Let me try using it the next time. But then, over the phone, it isn't possible! I prefer to remain silent most of the time and speak mostly through my writing. Wise girl you are but then when it comes to the real world, what do you do. Ah yes, but then in CCD, you weren't so verbose. You were silent in parts!! I guess you have this great image of you being an extra super extrovert, woman lover and so on. Why do you gloss over your already sweet personality, Doktor? Observations, such simple ones- they make me keep coming back to your blog. Have a lovely week ahead Susan! And, I love you when you comment so honestly. Hope life is great for you. Take care. I am sure by now you would have realised that I talk too much and seldom a time comes when i dont have anything ot say , I think thats what lands me in trouble mostly ..
Bikramji, ha ha. Sometimes silence is golden. Kaise kahoon, kya kahoon, kaise bataoon :)! Nice one makes one think of all the blogs that I visit and post comments but never get a reply comment on my blog. Khiss metti ke banne ho aap? "Do your duty" I believe. As if visiting and commenting on blogs is a duty!!! Sometimes it feels good to be acknowledged, Maheshji. I have had those moments but they are rare. I guess it is when you find difficulty to connect to a certain person. Great post Susan and hope you are doing well my friend! Thanks Nelieta. Sometimes the silences are quite awkward. I am good and hope it is the same with you. Oh, those silences can be awkward for sure! Susan, your words here made me reflect upon the times I've been in the same situations and made me think about how I can ameliorate them the next time they come up. Reflecting is something that should be practiced consciously. And, you are right about thinking and ameliorating them. Kajal, you will never have moments like those, I reckon. And as for food, they are the greatest escape points. Kids, I'm not sure! I do have these moments but not so often because I am such a chatter box. Sometimes I think I talk too much, maybe out of nervousness or fear of these awkward silences.But I understand what you mean. Thanks for sharing this Susan. God bless you. 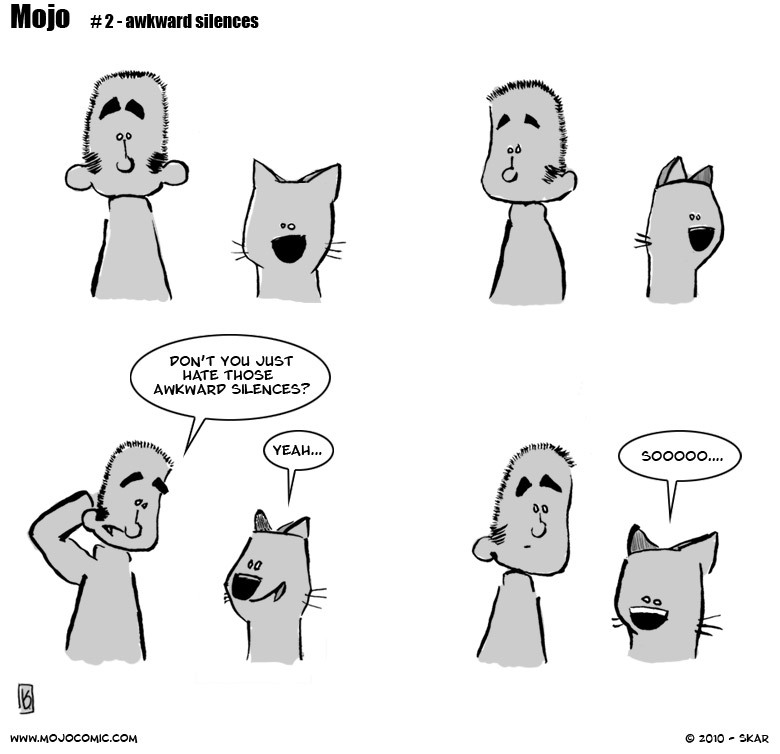 May you have less of these awkward silent moments. Most of the commenters here are chatter-boxes and no wonder that we all love to write posts! God bless you too, dearest Rimly. Much love. LOL, yeah BEEN thereeee!!! and this silence is some ugly communication, a way of saying "What next? Go fish!" and those blogger silences, I hayytee em! :) I try to be responsive to ALL my comments. Now that I have no great no of followers I find that easy, is it a TASK for those who blog a lot and have a lot of blogger friends? I ask (all).. It is not a task per say but it does take a lot of your time. For me, half a day goes in replying comments, visiting other blogs and commenting. I enjoy it nevertheless. I asked the other person questions. I've found most people, given the chance and interest, will talk and talk about themselves. It's a place to start. You never know where you will end up. It's not always easy, but it feels up the gap. Welcome here and thanks for stopping by to make a comment. Much appreciated. Looking forward to reading more of your blog. Starting a conversation with anyone comes naturally to me... 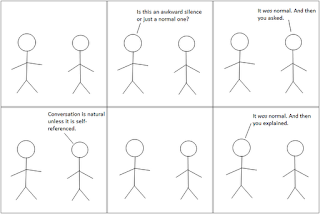 When I get the feel that an awkward silence is about to set in, I ask something which is common to everyone and keep the conversation going.